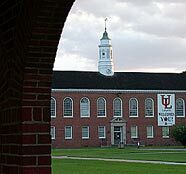 The University of Louisiana at Lafayette will conduct graduation ceremonies for the Spring 2006 semester on May 20. 9 a.m. College of General Studies. Keynote speaker is Dr. Forrest Byrd, associate professor in English. He is also the Faculty Senate President. 12 noon College of Liberal Arts. Dr. Stephen A. Kosokoff, retired professor from Portland State University will give the keynote address. He is known	internationally for his work in Human Rights. 3 p.m. B.I. Moody III College of Business Administration. Tom Cox , president and CEO of Golfballs.com will be the keynote speaker. Last year, Cox	was named “Rising Young Business Leader” by the Times of Acadiana. 5:30 p.m. Graduate School. Susanna P. Garcia, associate professor, School of	Music will perform. 9 a.m. College of Applied Life Sciences. Keynote speaker will be Lauren	Deranger, the college’s Outstanding Graduate. She is an apparel design and merchandising major and is the daughter of Lee and Cindy Deranger	of Opelousas. 12 noon College of Sciences. Keynote speaker will be Lanminh Pham, the	college’s Outstanding Graduate. She is a biology major and is the	daughter of Levy and Tan Pham of Abbeville. 9 a.m. College of Nursing and Allied Health Professions. There is no keynote	speaker. 12 noon College of Engineering. The keynote address will be given by Terry Huval, director of Lafayette Utilities System (LUS). He is a 1978 graduate	of UL Lafayette. 3 p.m. College of Education. State Superintendent of Education Cecil Picard will receive an Honorary Doctorate of Educational Leadership during this	ceremony. Picard is a 1959 graduate of UL Lafayette. 12 noon College of the Arts. Tom Sammons, professor in the School of Architecture will give the keynote address. In addition, Sammons is the director of the Community Design Workshop and was named a	Distinguished Professor in 2005 by the UL Lafayette Foundation.